Louisiana preparing for evacuation of up to 59,000 residents in near future - P.R.A.E.R. | P.R.A.E.R. Louisiana is finalizing a plan to move thousands of people from areas threatened by the rising Gulf of Mexico, effectively declaring uninhabitable a coastal area larger than Delaware. A draft of the plan, the most aggressive response to climate-linked flooding in the U.S., calls for prohibitions on building new homes in high-risk areas, buyouts of homeowners who live there now and hikes in taxes on those who won’t leave. The LA SAFE program defines as “high risk” land where, five decades from now, the expected depth of a 100-year flood will reach more than six feet. According to data provided by state officials, 94 percent of the land in Plaquemines Parish, which includes Empire, falls into that category. 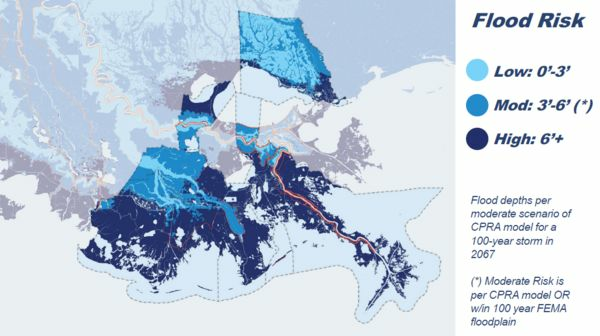 A state map shows areas of southern Louisiana at the greatest risk of flooding. Across the six coastal parishes covered by the LA SAFE program, more than 59,000 people live in those high-risk areas.